Received Live at Nearfest yesterday and listened to it on the way to work this morning, and again this evening. What a fabulous live album. This is THE Strawbs live album for me - better than Concert Classics, better than BBC Live in Concert, better than Greatest Hits Live which are the live albums it could be compared to. Just a Collection of Antiques And Curios is to me something slightly different than a standard live album, being primarily what was new material at the time, and its obviously an electric album so comparisons with Full Bloom are inappropriate. The band sound so powerful throughout the album. DCs voice is at its passionate best, and although he has a few rawer edges after the inevitable strain of touring, the fire and soul of his singing is beyond compare. Rod Coombes is a fabulous drummer, clearly evidenced here; for me, his style best suits DCs songs, thats not to criticise the others. His fast fills in "New World" are just superb, and his subtle cymbal work is magical in the quieter moments. Chas's power on this album is his class and restraint - never a showy moment, always appropriate and totally strong musicianship. I wish I could hear more of his voice in the harmonies, but perhaps this is a sign of the quality of the mix and production that its harder to "split" the vocals. Dave Lambert shows that he's lost none of his electric ability after playing acoustic for quite a few years primarily now. Vocally he's on great form - especially on "The Winter Long" where he tastefully avoids straining for high notes with confidence and skill. John Hawken is a real gem throughout this album - the sheer subtlety and feel that he displays is magisterial. "Burning For Me" is played with the tenderness you'd associate with Rachmaninov, but yet is not showy or over complex. His use of Mellotron patches supplied by Mike Pinder is superb - I'm sure Mike Pinder must be impressed by the results - would be interested to know if he's heard just how great they sound on this album. This album makes you ask questions though. Why aren't Strawbs massive? Why did musicians of this calibre have to endure quiet years during the 80s, questioning their careers and in some cases abandoning them. Although I missed seeing this band play live in the UK recently, this album IS consolation. A momento of a band still at its peak, an evocation of a songwriter who should be cherished by the world. I propose that we at Witchwood start a knight Dave Cousins campaign!! Boomer - thanks so much for your efforts and for arranging the sprinkling of "fairy dust" over this great performance. I lay down and put my foot up and rested to listen, undisturbed to what, I believe, is the single best live album by anyone that I've ever heard. Between the performances and the production quality, it will be hard to surpass. Indeed, there were moments at which I sang along, and moments when I was breathless. There were moments when I listened attentively and moments when I just let the music wash over me like waves, when the ocean is gentle. I picked out particular performances by DC, DL, Chas, John and Rod. They wove in and out of the songs like the threads of a Pashima shawl. Soft, forceful, triumphal. Everything in it's proper place and time. Boomer, you have said that you wanted this to be the pass-around CD, and surely it is. Only a Higher Power could have done better. It is as close to perfection as any I have ever heard, in terms of what it is and what it is meant to be. I am surprised that, like the Taj Mahal's one backwards brick, you have not put in one error to keep it from being too perfect. Congratulations to the Strawbs, to Boomer and to all who worked on this magnifcent piece. I'll play it first in my store today. 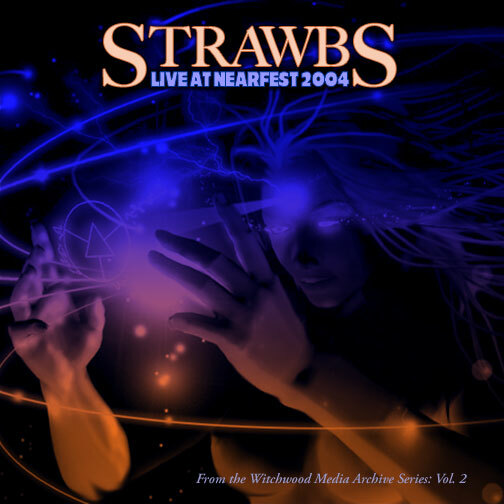 It was indeed a great honour for The Strawbs to receive headline billing at the 'Nearfest Festival 2004'. I did not realise until reading on the internet what a big event this festival is, I seriously wanted to go. But financial commitments and getting time off work held me back, but after listening to this stunning live recording how I wished I had got time off work, loaded up my credit card, and got on the plane and headed off to Bethleham, Pennsylvania, USA, and be there to witness a world class band performing one of the best live shows I have heard in a long long time. The recording quality is exceptional, the band sound terrific and the songs that I have heard so many times sound so fresh and lively. The Strawbs must have spent a great deal of time rehearsing for the show as the production is superb. The whole package from the front cover to the picture disc, and the selection of the songs old and new makes this a must have for all Strawbs fans. In some respects when I listen to this album it makes me angry because when you listen to these superb muscisions performing "Burning For Me", "Autumn", "You And I" I sat thinking to myself this band would grace the stage of any big festival, some of their albums post Bursting At The Seams should have been number one best sellers in the UK and I just cannot understand why not. But for the likes of you and me, we have been privalged to be part of this great musical jouney, we have over the years seen the transformation from a folk band to a totally unique and original rock band. We are indeed the lucky ones. I was driving along the coast yesterday evening listening to it and it sounds so powerful. Stand out cuts are "New World", "Autumn", "Down By The Sea", "Burning For Me", "Heartbreaker" (which has a killer John Hawken solo on Moog that even David Cousins looked at me at playback and said: "What was *that*?" -- it is quite good) and others. I really do believe that this is that Strawbs album that fans can hand to their non Strawbs fan friends who never understand why we love the band, and they will get it listening to this album. The work is very solid and while there are indeed "squibbed" notes here and there, it is a powerful document of a great band doing what they love to do.